If you missed Part 1 of 'Background into Risks and Opportunities', read it here. A comprehensive understanding of the whole value chain and the three spheres of sustainability – environment, social and economic – may be helpful in identifying the drivers of risks and opportunities. Public reporting sources such as CDP are educational and can help lead companies to examine and evaluate risks and opportunities. CDP and the investor community encourage companies to think about and actively manage their specific risks and opportunities driven by regulations, physical climate parameters and climate-related developments. For 2016, CDP is placing a greater emphasis on having processes in place to manage risks. Once you have all your risks and opportunities identified, assessing and prioritizing them is crucial to managing them. 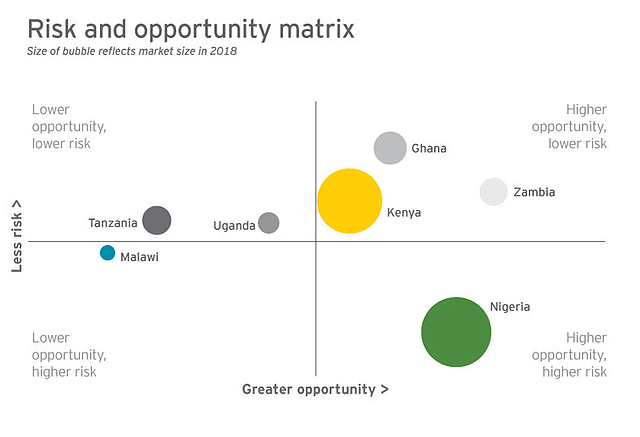 You may want to do a cost-benefit or ROI analysis to quantify all risks and opportunities, or visualize their levels and scales by creating a bubble chart, like the one conducted by Ernst and Young for evaluating the risks and opportunities in African insurance (Figure 2). 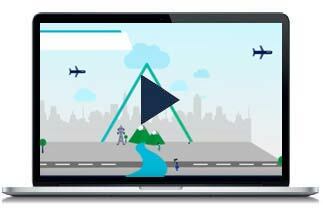 These quantified impacts and magnitude allow you to prioritize and rank risks and opportunities, in order to allocate corresponding budget, resources and control solutions. 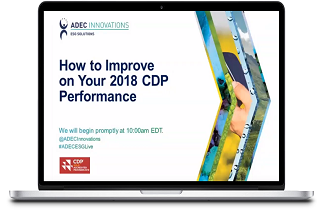 For CDP's 2016 reporting season, companies can achieve partial points for assessing these financial implications in a qualitative way, although a quantitative approach is needed for full credit. When managing risks and opportunities, using professionals to support, alter and address risks, and to optimize opportunities is a good strategy. Innovation is also supportive in balancing risks and opportunities — or even turning risks into opportunities. Facing increased costs and lower profits may also make you more innovative and competitive, bringing you the opportunity to differentiate yourself, gain competitive advantage and stay ahead of upcoming regulations, and giving you access to a larger market. A robust process to regularly assess, prioritize, and manage risks and opportunities can help your company thrive and compete well within your industry group. FirstCarbon Solutions (FCS) fully integrates business intelligence consulting, software and program management with unmatched expertise in back office data processing to put you on the path to sustainable efficiency. Our unique industry perspective empowers you to understand your sustainability strengths, weaknesses and opportunities in sustainability. For more information on global trends in risks and opportunities, subscribe to our monthly newsletter, GreenWatch.